Every get caught up in the excitement of something new and forget the past lessons learned? An ‘ah-hah’ moment hit a couple days ago here when we were discussing what we really need to do with our documents on our iPads. Getting away from the ‘notes’ apps, we have been speaking a lot about being able to edit the documents we created on our desktops or viewing PDFs – never crossing the paths. In our long history with the iPhone, one item was always true. You can edit Word Docs on your iPhone, but did you really want to? Many of us tried over and over again but in the end we all went to creating new notes or strictly viewing desktop created documents. The easiest way to view your desktop notes and your scanned hand scribbled paper notes was to convert them to PDF. What we have been using for years and was just updated for the iPad available screen space is iAnnotate. It’s file management and screen viewing options are pretty good. 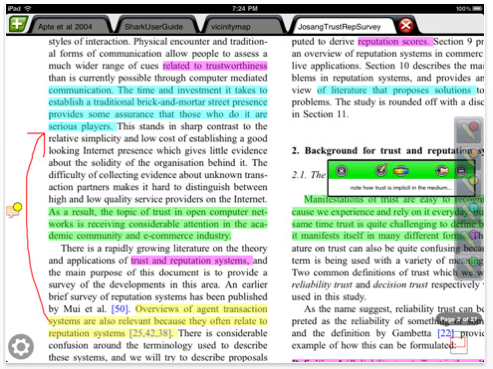 iAnnotate’s real power is bringing you the ability to edit and mark up your PDFs!!! Those edited PDFs can then be synced back to your desktop via their free Mac/PC desktop software. The desktop software isn’t a viewer app, it is just a sync conduit. The files you marked up on your iPad are synced back to selected folders of files and can be viewed via your normal PDF viewer. We copy/paste text, circle items and add text notes, bookmark pages and highlight text within any of our PDFs. Get a real bang out of your next Web page review meeting… take a screen shot of your client’s Web site and mark it up on your iPad. Then send your client or your team the marked up page as a PDF that they can reference. We are going back to using iAnnotate every day to get to what we need… information is handy and easy to share via PDFs.